Lovely Hampton Lakes Villa with Free Wi-Fi, Game Room and Beautiful Pool and Lanai! This lovely and elegant villa, located in Hampton Lakes ,is a perfect holiday destination for a small family or group of friends. Cozy living room, dining area and pretty bedrooms create nice and comfortable environment for you and your family. Children and grown-ups will love to spend some quality and fun time in the game room, playing pool, foosball or ping-pong. The house also features crystal clean pool with spacious lanai area! Outside furniture and lounge chairs allow to enjoy beautiful sunny weather outside and relax after busy day in the Parks. 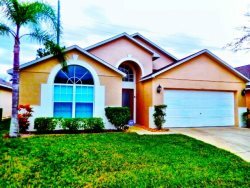 House is located in beautiful Hampton Lakes community.A private neighborhood set amongst rolling hills and orange groves, Hampton Lakes is an ideal location for Disney vacation rentals. Guests also have access to a community pool, a sand volleyball court, tennis courts, and a playground for children. Located on Hwy 27, Hampton Lakes is only minutes away from the new Champions Gate world-class golf resort and Walt Disney World.